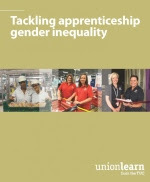 The Tackling apprenticeship gender inequality guide looks into why trade unions and union reps should negotiate for gender equality in apprenticeship programmes. The guide offers good practice examples and practical advice on issues which are pertinent for women entering apprenticeships such as improving women’s participation in male-dominated industries, addressing the quality and flexibility of apprenticeship programmes and questions about health and safety and pay. Tackling apprenticeships gender inequality is part of a series exploring supporting under-represented apprenticeship groups. The other guides in the series are Supporting Black and minority ethnic apprentices and Accessible apprenticeships.